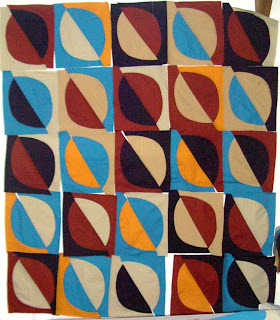 These are some blocks that I made 2 or 3 years ago that were the start of the "Night & Day" quilt. I had started a second top with some more of the blocks, but never finished it. I recently resurrected it and finished assembling it. Then I loaded it on the longarm quilting machine. I started quilting it with Sulky 12 wt thread and liked the looks of the variegated colors. But the thread kept breaking and after 4 hours of fighting with it, I hadn't completed the first row! I've had pretty good luck in the past with corrective measures such as changing the top and bobbin tensions, changing the tension on the fabric, re-threading, putting in a new needle, trying a different spool, etc. But since nothing seemed to work and many of the thread tension adjustments resulted in loose thread on the back, it was time to give up! A change in thread provided the solution!! The 35 wt Valdani thread didn't break once -- WooHoo!! The working title choices for this piece so far are Black & Blue Moons or Blue Moons. Very nice piece. Really keeps your eye moving both ways. But it is your old palette!